WASHINGTON — President Trump said the recovery from Hurricane Harvey would be "hopefully a quick process" after arriving in Texas on Saturday to tour massive damage caused by the Gulf Coast storm in Houston. Trump and his wife, Melania, mingled with victims as they visited the NRG Center, one of Houston’s designated emergency refuge areas. The president helped serve lunch, handing out hot dogs in white containers with the Red Cross logo. Trump said families he spoke with at the center seemed happy. "It's been very nice. It's been a wonderful thing. As tough as this was, it's been a wonderful thing," Trump said. "I think even for the country to watch and for the world to watch. It's been beautiful." Trump was seen crouching to engage with children while hugging others and shaking hands. "There’s a lot of water, but it’s moving out. 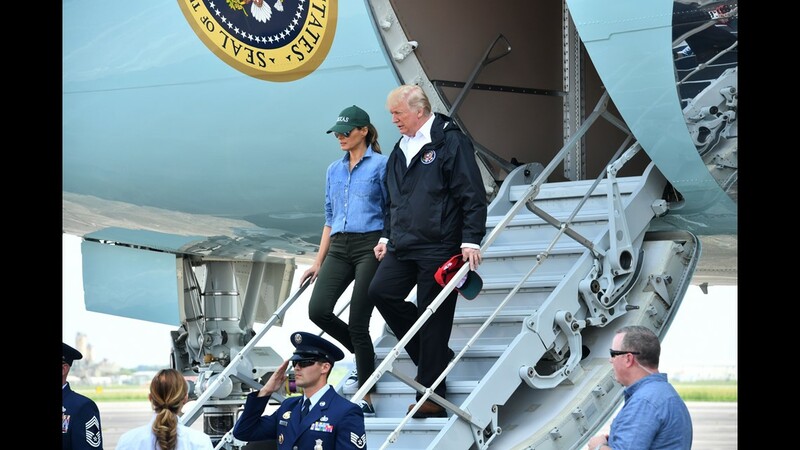 Most importantly, the governor, the relationship with the governor, the mayor and everybody, it’s been fantastic," Trump told reporters while touring the relief center. "We’re signing a lot of documents now to get money” and it’s “going through a hopefully quick process." Speaking at First Church in Pearland, Texas, Trump noted that the coordination between local, state and federal government officials was "terrific." Texas Gov. Greg Abbott, Texas Sen. Ted Cruz and four Cabinet secretaries joined the president on stage. “You got a lot of hard working people, I’ll tell you that,” Trump said. The Trumps arrived later Saturday in Louisiana to meet with more victims. Shortly after arriving in Houston, Trump took to Twitter to underscore his commitment to rebuilding efforts. "We are with you today, we are with you tomorrow, and we will be with you EVERY SINGLE DAY AFTER, to restore, recover, and REBUILD!" Hurricane Harvey is Trump’s first natural disaster as president and it could be the costliest natural disaster in U.S. history. The trip is his second to Texas since the hurricane ripped through the southeastern Gulf Coast. On Tuesday, Trump visited Corpus Christi and Austin to meet with local officials, while drawing some criticism for failing to mention the victims of the storm. Vice President Pence later visited the area with his wife Karen to meet directly with survivors and underscore the administration's commitment to rebuilding the affected communities. On Friday, Trump requested from Congress $7.9 billion in emergency spending to help Texas and Louisiana recover from the flooding disaster. It would add $7.4 billion to Federal Emergency Management Agency disaster aid coffers and $450 million to finance disaster loans for small businesses. The request would only be a down payment on the total costs to rebuild waterlogged Houston and the surrounding area. Abbott has said the cost could exceed $125 billion, more than the $100 billion-plus price tag for Hurricane Katrina in 2005. Trump has also pledged to give $1 million from his personal funds to help disaster relief, according to the White House.